Rev. 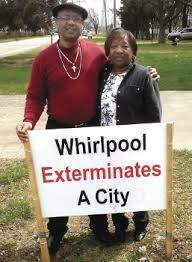 Edward Pinkney speaks out against Whirlpool’s corporate takeover of Benton Harbor, Snyder’s Emergency Manager law May 26, 2012. Rev. 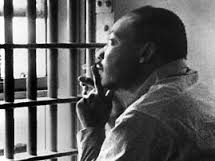 Martin Luther King, Jr. in prison during civil rights movement, during which he gave his life. 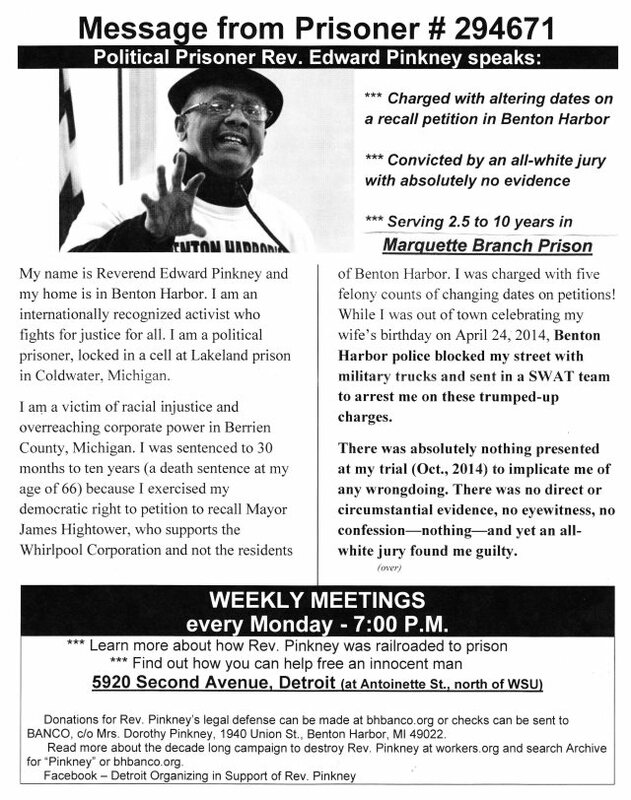 DETROIT–Late last month I sent a letter to President Barack Obama requesting him to give a presidential pardon to Reverend Edward Pinkney, an African American civil rights activist, an elderly man of God now in a prison in Marquette, Michigan. I have done so, because of the many irregularities and violations of civil rights in his case. I hope those concerned about civil liberties and due process will make similar requests. Reverend Pinkney’s plight is frighteningly similar to a situation faced by another clergyman in 1960, when Dr. Martin Luther King was imprisoned in a southern jail for a mere traffic violation. This elderly man of 67 may face a long imprisonment. His prosecutor Michael Sepic earlier called for a life sentence. Rev. Pinkney is appealing the sentence he received in December, of 2.5-10 years. The reverend has never been accused of killing anybody or robbing anybody. The prosecutor claims he was trying to avoid a legal technicality. Rev. Edward Pinkney with his wife Dorothy Pinkney. 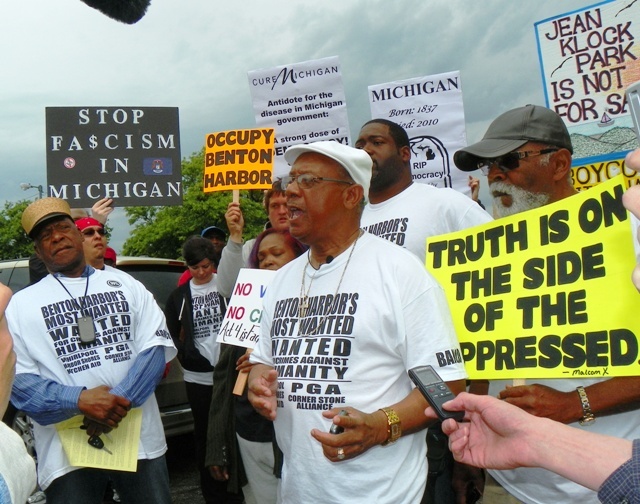 Reverend Pinkney, as noted in past articles, was simply organizing a petition drive to recall the Mayor of Benton Harbor, because of what he considered a corrupt giveaway of much of Benton Harbor’s public land to Whirlpool Corporation. Under Michigan law he was in his legal rights to do this. However, there are time limits for signing such petitions. Prosecutor Sepic claims some of the dates were altered and set back in order to conform to these time limits. On October 3, 2014 the reverend was found guilty of altering these dates. He was never found guilty of forging signatures. From press reports it seems clear the required number of voters expressed a desire for a special election to recall the Mayor. The question is when they did so. This seems to be a case of politicians in office ganging up on a citizen who was trying to get another politician out of office. If someone altered dates on a petition to get the Mayor reelected, I doubt that there would be attempts to get such a severe sentence. The case seems tainted with politics and I believe Reverend Pinkney is, in effect, a political prisoner. If Reverend Pinkney were white, one wonders if such severe measures would ever be considered. There is good reason to question whether Reverend Pinkney was guilty of the “crime ” he had been accused of. Defense witnesses at his trial said the petitions went through many hands and other people could have altered the dates, if indeed they were altered. In the American system of justice citizens are innocent until proven guilty beyond a reasonable doubt. In Reverend Pinkney’s case, there are a multitude of reasonable doubts. 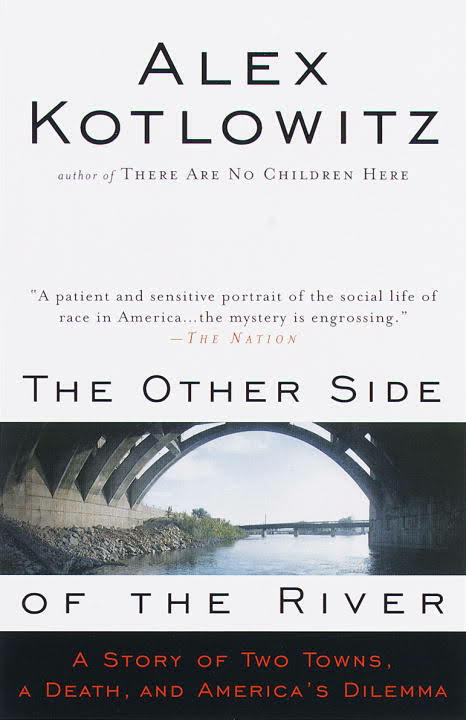 Nationally acclaimed book told story of drowning of Black Benton Harbor youth, with chief suspect the Sheriff of Berrien County. There are also very good reasons to doubt the fairness of the trial itself. It did not take place in Benton Harbor, where the alleged offense was committed, but in the Berrien County Court in St. Joseph, a virtually all-white city across the St. Joseph River from virtually all-Black Benton Harbor. Reverend Pinkney, who as I noted is an African American, was tried by an all-white jury. There seems good reason to suspect the process was manipulated to make him vulnerable to racial prejudice. Reverend Pinkney is appealing his conviction for good reason. However, he has been denied the right to post bond while making his appeal. One certainly must wonder why authorities are so anxious for us taxpayers to pay for this man’s imprisonment before his case is concluded, rather than saving the space for rapists and murderers. Why not let this man prepare his case at home, have better access to his lawyers and some time with his wife and family during this crucial period in his life? Actually right now it is difficult for his lawyer and family to get in touch with him. He has been transferred against his will to the Marquette Prison, which is nearly 500 miles away from them. Last week his phone “privileges” were revoked making him almost completely isolated from the outside world. Chris Gautz, who handles public information for the prison, claims that this was because Reverend Pinkney violated prison rules by arranging to make a three way call to someone that was not on his regulated phone list and calling people on behalf of another inmate. It was impossible to get Reverend Pinkney’s side of the story, because, of course, it was impossible to reach him by phone. As in the case of Dr. King in 1960, Reverend Pinkney’s friends and family are concerned about his safety. There is certainly reason to be concerned for this elderly man’s health. It has been said when he first came to Marquette he was placed in a moldy cell, causing dizziness and making it hard for him to breathe. Reports say he was transferred to another cell that was moldy but less moldy. Now he is cut off from the outside world, no one can find out about his health and safety or even know if he received his letters. 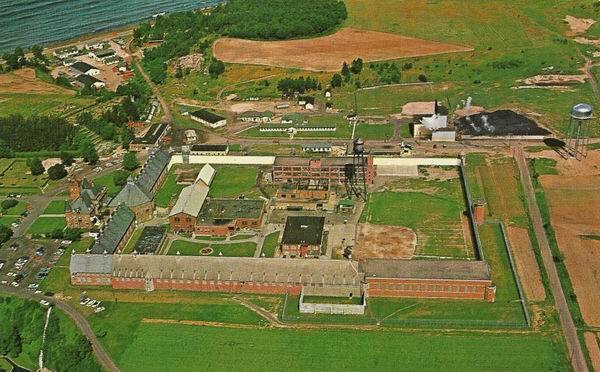 Since Marquette, Michigan today is not a part of the old South (ostensibly), one hopes that if Reverend Pinkney is killed or harmed that those responsible for this situation will face the full weight of the law. If so, some authorities might discover what it is like to be in prison. Such a redress, though, would be far too little and too late. Pres. 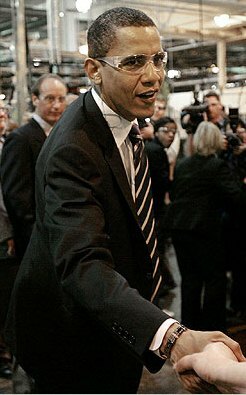 Barack Obama touring Chrysler Warren Stamping Plant. In 1960, John F. Kennedy, simply as a candidate for president, made phone calls on behalf of Dr. King and secured his release. As president, Gerald Ford gave a presidential pardon to Richard Nixon before he went to trial for anything. More recently President Bush gave a pardon to his aide, Karl Rove, after he was convicted of threatening national security. It is time for our current president to provide such consideration to an elderly clergyman. Let him out of jail. To express your views to the president, call his comment line at (202) 456-1111 or write President Barack Obama, 1600 Pennsylvania Avenue, Washington, D.C. 2050. To download flier below, click on Pinkney.